A lack of communication and failure to follow procedure is interfering with the production of the Concordia Student Union once again. Various changes to the organization’s bylaws are in danger of disappearing should they not be included during the general elections as a referendum question.This process not only went undone, but also went unnoticed until Judicial Board Chairperson Nick Cuillerier brought it to the attention of council last Wednesday. The oversight could mean that revisions to bylaws ‘I’ and ‘J,’ and a modification to bylaw 10.2, fall flat before they were ever truly recognized. 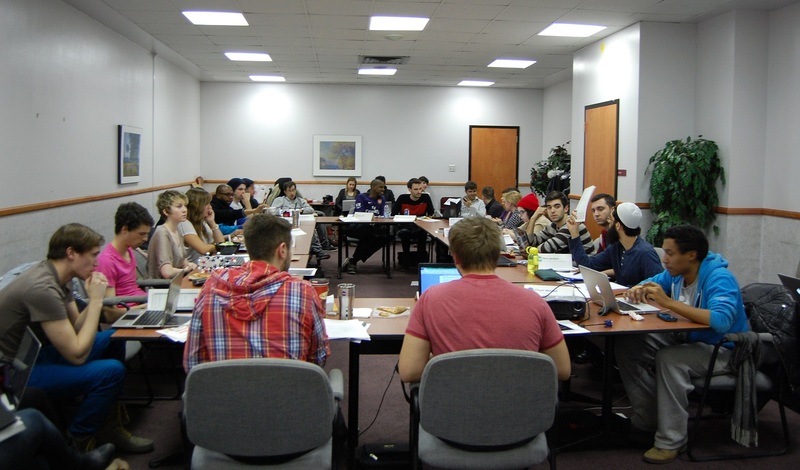 Bylaw ‘I’ was changed to reference bylaw ‘J’ to provide a committee to oversee the spending of the student centre fund. The executive did not realize the implications until it was brought forth after Cuillerier saw a notice of polls poster at Concordia the same evening. The mistake, while VP clubs and internal Nadine Atallah promised it would be quickly rectified, garnered backlash from council. The executive did not have a clear answer as to why the notice requirement was never done other than it was an error. As the notice requirement was not fulfilled, the CSU used a notwithstanding clause under the standing regulations since the changes were not announced in the postering. “Any ordinary motion, resolution or regulation who derogates from the code can only be adopted with a clause stating that the motion operates regardless of the code of standing regulations. The clause must state which article(s) are not to be applied towards the motion. Such motion requires a 2/3 majority vote and will cease to have effect 4 months following its approval,” standing regulation 267 reads. This allows the revisions to the bylaws to be put to referendum and the executive was mandated through a motion to issue an email to the undergraduate student body to inform them of the question before 6 a.m. Thursday morning but has to yet to do so. A Senate report from VP academic and advocacy Hajar El Jahidi was missing from the documents presented to council last Wednesday. Councillor James Vaccaro asked for the report but El Jahidi was absent due to illness. However, since Vaccaro and Senator Chuck Wilson were both present, they quickly went over the details of the last Senate meeting. It also came to light that El Jahidi, since taking her mandate in November, has yet to attend any Steering Committee meetings. The total number of meetings is now at five, three of which El Jahidi was part of the executive for and has missed. Speaking to The Concordian, El Jahidi said that her absences were unfortunate but were out of hands as factors including IT problems and sickness prevented her from being present for Senate and steering committee meetings. “For steering committee I was very unfortunate as I haven’t been able to attend. For the first meeting I was out of town but I sent my regrets, and for the second one I was sick and I couldn’t make it,” she said. El Jahidi also said omplaints about her absences were never brought to her prior to being aired elsewhere such as at CSU meetings, and that despite difficulties attending meetings she had made an effort to keep up with Senate and steering committee events. Conversely, Senator Chuck Wilson said that is not true. Wilson said that he was sending updates on meetings since February. Part of the responsibilities of VP academic include the coordination and the chairing of meetings of the student academic caucus, as well as sitting on Concordia’s academic bodies. A Senate report has yet to be filed. The same meeting produced remarkable tension throughout the room, this time aimed at Chairperson Jean-François Ouellet for not following procedure during council. During multiple votes, Ouellet counted abstentions within the total number of votes — a process that violates Robert’s Rules of Order. An abstention, or the refusal to vote, is not technically supposed to influence the outcome of a vote. Furthermore, council lost patience with Ouellet when he refused to acknowledge Councillor Gonzo Nieto’s challenge to the chair toward the end of the meeting. Both Nieto and Walcott left shortly after the challenge was disregarded.